The world famous sculpture has puzzled me with its expressions and gestures to the extend that I decided to reflect on its meaning for every thoughtful viewer. But first let me give some basic information about the figurative sculpture. 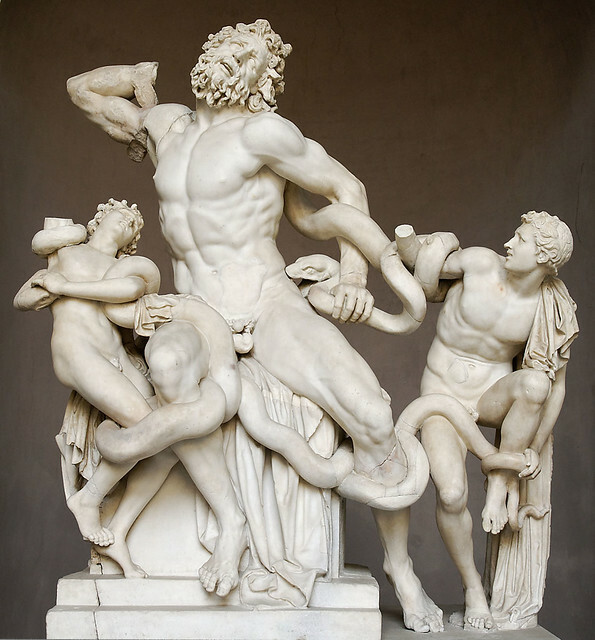 It is depicting the Trojan priest Laocoön and his sons Thymbraeus and Antiphantes. They are being severely attacked by sea serpents. The sculpture is a marble monumental copy probably of an earlier bronze version. 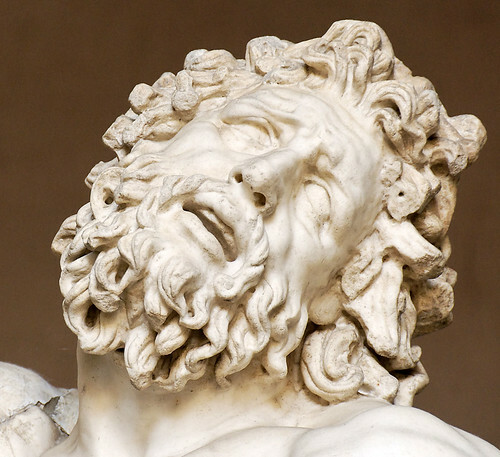 It is attributed to three Greek sculptors – Agesander, Athenodoros and Polydorus. The sculpture is dated between 27 BC and 68 AD. It is considered as an epitome of the human agony, as an icon of suffering and straining. I myself have seen this marvelous piece of art at the Museo Pio Clementino, in the Vatican and have to share with you that the sole luminance of it is epic not only in details, but in its equity. Somehow it shows to us that the human suffering has no redemptive power most of the time and that we are mere objects of our problematic nature of flesh and soul. The legend on which this sculpture is based is another reason why I think that it is always impossible to change the outcome of the mere human life. And that is why this ancient Greek sculpture is a symbol of truth for me – the various emotions which are evoked in us are only what they really are – reflections of our materialistic and limited shell inside which our soul flickers. What draws us to it? Why do we reject it? What tinkers inside you while you look at it? Modern art is created so that we misunderstand it. And is constantly changing to keep distance, so that we can’t catch up. Looking at it, we see exactly the same as the ancient cavemen were trying to see in the pictographs in rock – an attempt to explain the present world around us. Where we come from, where we are and where we’re going. And this constant pursuit touches something profound in us. Namely the divine spark of the human mind! The meaning of art is its strength. When you ponder a work of art, you have an opportunity to look through art deep inside. It’s nice to realize that possessed depth. Depth of the soul. Art is a metaphor for the soul. Through art, we also rediscover our connection to nature which we lose in the everyday life. Artwork can cause a clear and direct impression, but it also may require more prolonged and profound interpretation. Everyone sees art through their own eyes. Being able to see the world clearly is related to the ability to be able to do something about it. Art through the ages much earlier than civilization itself concludes that the Bible and religion is just a metaphor, and that we live in reality. The truth of art can also be a God. The balance between playfulness and seriousness in art reaches deep within us and speaks to us. Art has long exceeded the desire and the need to recreate the exact reality. Art is the colors, shading – shading into each other. And masterpieces proudly express that. Every time you look at them you see something new, something different. And every masterpiece always speaks the truth to us, because it is always our interpretation of it. Nowadays we are threatened by modernity, progress. The change is often seen distant and perverted. The truth is that we can see different types of humanity in different approaches to art through the ages. In art we see what we are, what we do, what we must do to survive. To see clearly is everything – poetry, philosophy, and all forms of expression. Feelings of emptiness and dissatisfaction, and our reaction to the continued pursuit of excitement and sensuality to overcome them – this is art. It shows us what civilization means to us. Art connects us to the primordial divine touch. And no, I’m not talking about the type of art which changes every five minutes, but the continuous mode of thinking in the pursuit of enlightenment, which is achieved through blending the past with the present. Habits and Familiarity. Should we learn to live with lies? We can open our eyes and see. See art as such – how it exists, how it is connected with the world around us and life through its forms, metaphors, actions. The artwork is always wide-eyed. It is not the difference between good and bad, wrong and right. It is the ability to judge the existence as such. To believe that it can be changed. The role of art is to provoke our consciousness and perception of the moral values in life. To encourage our minds to think about what really happens in life. And you do not need to be an artist to understand this. You only need to live!